The clipart images on this page are from the Great State of Georgia in the United States of America. 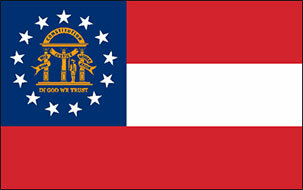 Georgia is one of the original Thirteen Colonies. Above are animated versions of the three flags adopted by the state of Georgia since 1956. Most people are seeking the current flag, of course, but when we remove the other 2 we receive occasional requests for them. So, we are keeping them on this page for historical reasons. Also, we are a little lazy and it's easier to leave them than to send them by request. 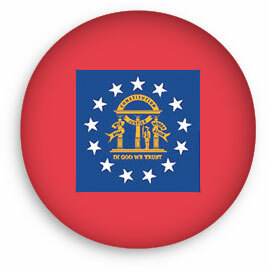 Square Georgia flag button clipart. Rectangular Georgia button with rounded corners. State of Georgia map flag. 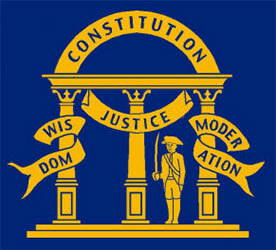 Seal on the Georgia flag. 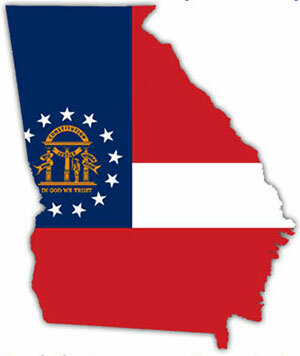 You may use our animated Georgia flag clipart on your personal and educational websites.